Every so often, a piece of software comes along that really is universally beneficial to everyone, everywhere, because it resolves a problem that we all could face someday. 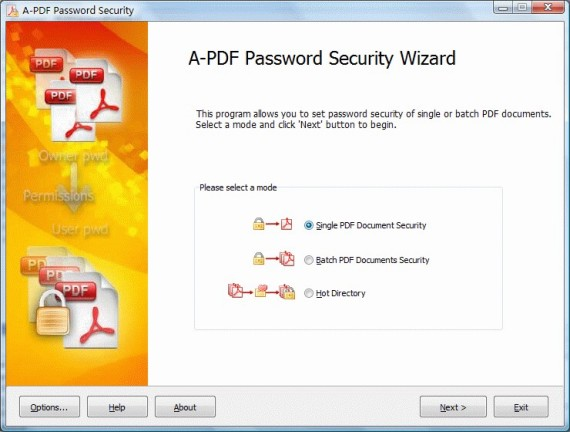 A-PDF Password Security removes passwords from PDF files, and also allows you to encrypt PDF files with password protection. Not only that, it can perform these actions on multiple documents as a batch - just set it and forget it! Your newly unlocked PDFs will be waiting for you when you get back from your extended lunch break. A-PDF Password Security uses 128-bit encryption (supported by Adobe Acrobat Reader 5.0 and higher) to protect your PDF files from prying eyes. It even goes above and beyond password protection by allowing you to impose access restrictions to the file. You can even set up a hot directory so that all files written to that directory are automatically password-protected. Please Note: A-PDF Password Security can not automatically find or remove an "open password" if it is not already known. If the PDF is protected with a "master password", however, all A-PDF Password Security functions work whether you know the password or not. 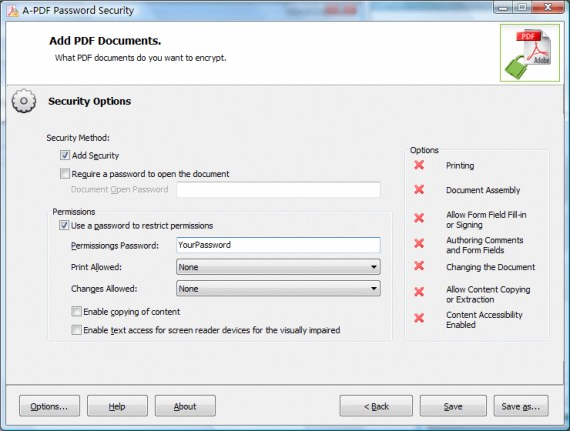 Remove passwords from password-protected PDF files. Password-protect PDF files using 128-bit encryption (supported by Adobe Acrobat Reader 5.0 and higher). Remove and apply password encryption to single files or multiple files in batch. Create a hot directory where any file copied to that directory is automatically encrypted.